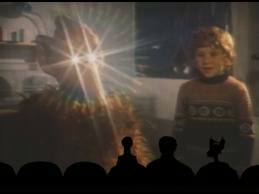 One of my favorite shows of all time, I’m sure most everyone who would read this blog is familiar with MST3K. The very essence of Post Modern Trashaeology (having fun with goofy old movies, from low budget horror to badly acted third rate action and spy films, weird foreign fantasy movies, Japanese monster movies, Mexican wrestling movies, the ever popular badly produced tv movie, and of course the shorts), it ran from Nov 1988 to 2004 (with new episodes being produced up until August of 1999), but really caught it’s stride in the early ’90s. The main thing that stood out about it was the humor- it was wacky, clever, snarky, and offbeat but not unpleasantly so. Quaint in a way. You had to have a certain mindset to really get it (not the overall synopsis of people heckling bad movies- anyone can get that; but the style of humor) and enjoy it, and it’s an oddity in the early ’90s pop culture landscape (along with things like the Church of the SubGenius and shows like Red Dwarf). The humor was often quite high brow, referring to classical works of art and music, obscure scientific and historical facts, and film and tv references only a real geek would get. But then they’d turn around and throw in a corny old school joke that would fit in a 1950s comedy. This mix of humor was part of the charm, and you’d have to be pretty damn bright to get even most of the references (which actually also has a downside to it- almost no one could get all of their jokes and references, so most anyone is left scratching their head at some point or another). It’s the ultimate show for geeks of most any kind. The skits were generally fairly clever screwball comedy, and the movie heckling was a mix of Gen X snark and old school Firesign Theater type of humor that hasn’t been seen since. It’s low budget but charming in a old school BBC production or Red Green sort of way. 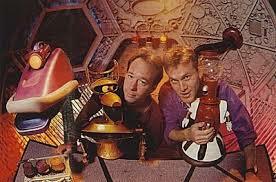 The members have gone on to do many other things (several along the same lines as MST3K, most notably Rifftrax) and a good amount of episodes are available on DVD from Shout Factory. Unfortunately the show is not available in season sets like most tv shows because of the difficulty in getting the rights to all of the movies that were featured in each episode (but fortunately, most of the unreleased episodes are available on youtube!). I’m putting these in no particular order, because I really like most of them about the same, but I’ll say that this one is definitely one of my topmost 2 or 3 fav episodes, so I’m putting it first. This episode has it all- the movie is wacky, but actually really interesting and looks pretty damn good for it’s time (1966). It’s the last of 4 Russian- Finnish fantasy co-productions (the other 3 being Magic Voyage of Sinbad (aka Sadko, a movie which Steve Fenton from Killbaby ‘zine raved about here) from season 5, The Day the Earth Froze from season 4 and The Sword and the Dragon from season 6), and if you’ve never seen any of them, you should definitely check one out (they put the fantasy into fantasy films). 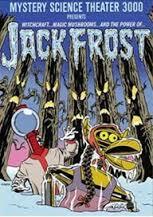 Jack Frost is my fav. It tells the twin tales of a dopey young man who sets out to seek his fortune and the adventures he has when meeting up with a mischievous wizard, a pack of bandits, and an ugly old witch as well as a charming young woman who lives with her evil Step Mother and sister who meets Grandfather Frost (hence the name) in the woods and what happens when their stories intersect. The riffing is quite hilarious in this episode, and they have a lot of bizarreness to comment on. They’re at the top of their game. The skits are all pretty funny as well, with a lot of classic humor bits. A great episode. 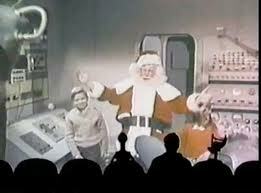 This one is often overshadowed by the other Christmas episode (Santa Claus Conquers the Martians, from season 3), but I think this one is much better. The movie is once again a bit bizarre, a Mexican Christmas movie in which Santa Claus lives in a creepy kingdom in the sky (complete with child labor), and on Christmas Satan sends a devil to corrupt children and try to foil Santa’s job. The gang does a good job of pointing out how unintentionally creepy it is, and the riffing is once again top notch (and gets a bit dark at times, which is always fun). The host segments are mostly fun (not as good as Jack Frost), and even include a reference to John Carpenter’s They Live. 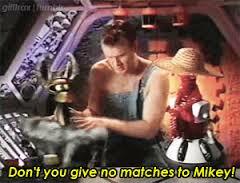 One thing you hear a lot when discussing MST3K is the Joel vs. Mike discussion. Just like the Kirk vs. Picard discussion, most everyone has an opinion (some quite vehement). Personally, I like them both, but I like Mike a little more (and like more episodes from when he was host). When Joel left in the middle of season 5, and Mike came in, it changed more than just the host- it changed the whole feel of the show. Joel was far more of a gentleman, kindly and almost like an ex-hippie. Mike was more Gen X- sarcastic and self deprecating, he had a bit better comic timing as well. But I still like Joel and the episodes he was in fine, such as this one. 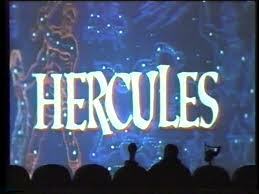 The movie is classic sword and sandal from 1957 starring Steve Reeves as Hercules. They mix up their Greek mythology a bit (and the gang makes several quips that only a mythology geek would get) so he hangs out with Jason and they go after the Golden Fleece. The skits are decent but not over the top- fairly quaint for the most part. I know that I’m in the minority when I say that season 8 is my fav season of the show. I don’t know why- maybe it’s because season 7 wasn’t that great, or maybe because I was so happy that the Sci-Fi Channel picked them up after Comedy Central dropped them, but season 8 really clicked with me. At any rate, I’m having to try hard not to pick too many episodes from season 8, because I like so many older episodes as well. Directed by Roger Corman for AIP (a match made in MST3K heaven), the movie is once again a fantasy about a modern (well, for the 50s) woman who is sent back into the mind of an earlier incarnation of herself. There’s witches (one played by the 50 Foot Woman herself, Allison Hayes), a devil, swords and villagers, a singing gravedigger, medieval inn, and an imp played by Billy Barty. The skits in this episode are all part of a larger storyline (something they did in the Sci Fi Channel years), but are all great. Let’s get this out first- this movie is fairly boring (about an escaped convict gaining the power of invisibility, directed by Edgar G Ulmer, the man who put Boris Karloff and Bela Lugosi together in The Black Cat). The riffing on it is decent, but not top notch. It would be an average episode except for two things: first, the short (The Days of Our Years) is my fav short they ever did, and might be some of the funniest 10 or 15 minutes I’ve ever seen on tv. It’s about a minister who walks around a rail road town, telling the stories of 3 hapless people who weren’t careful and paid the price. The riffing on it is fantastic- dark and witty, with no missed opportunities. The second reason this episode is so great is because the skits are top notch- very funny. Some of the best in the series. 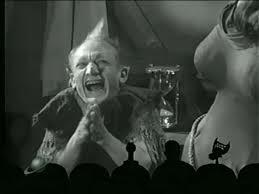 This was the very first episode of MST3K I ever saw, and therefore holds a special place in my heart. The movie is goofy, and super ’80s (mixing a Friday the 13th style teens in the woods getting bumped off story with a retro-fitted E.T. style boy-meets-alien story, by the man who directed the gritty and sleazy Pieces one year before, and who would show us a slug with teeth biting someone’s finger just 5 years later in his movie Slugs). The riffing is pretty damn good, there are 2 memorable songs, the skits are quaintly amusing, but I’ll chalk this one up to nostalgia. Another extremely ’80s movie, it mixes the Mad Max post apocalyptic stuff with a Valley Girl teeny bopper movie. The director not only shot a bunch of second rate ’80s action movies (including The Sword and the Sorcerer, a movie that I thought was the coolest thing ever when I was a kid (especially the 3 bladed sword)), but also the infamous and truly awful Captain America movie from 1990. He’s actually still making movies today. The quips in this one are great, and the skits are pretty damn good too. I still get into ‘girly movie’ fights with people (as the gang does over the end credits of the movie in this episode). This movie is unintentionally hilarious even without the quipping, so when you put the two together, it’s priceless. 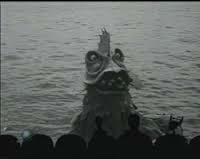 Some really goofy looking monsters attack a beach party type movie, complete with all the cheese. 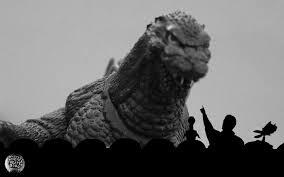 The skits are not fantastic in this one, but the movie and riffing make up for it. Director Del Tenney went on to do I Eat Your Skin. Here’s another Joel episode, and another one that the shorts bring it up from being simply a good episode to being one of my favs. I esp like the second short (Appreciating Our Parents), but the movie quips are quite funny as well. It’s about a mad scientist trying to find the answer to everlasting life, and features both John Carradine AND Tor Johnson (and Allison Hayes again)! 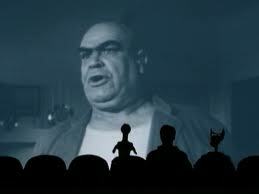 Contains one of my fav lines from a MST3K movie “Time for go to bed!”. 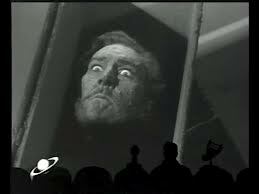 John Carradine’s death scene is very reminiscent of a scene from Roger Corman’s adaptation of Poe’s The Facts In the Case of M. Valdemar (with Vincent Price) in his anthology Tales of Terror. This movie is quite drab, about a psychic girl who visits a dude ranch that contains the buried, living head of a medieval sorcerer. The riffing is great, and the skits (which are part of a greater storyline, one that continues in The Undead mentioned above) are all fantastic except the Civil War one (which is a little boring). Still an excellent episode. There are plenty of other completely awesome episodes, some I could easily have picked instead of a few of these (it was hard to narrow it down to 10, so several that I like just as much as a few of the above ones had to be cut- some other favs include the other 3 Russian-Finnish productions (mentioned above), The Beginning of the End, The Deadly Mantis, Attack of the Eye Creatures, I Was a Teenage Werewolf, The Deadly Bees, Godzilla Vs. Megalon, Agent For H.A.R.M., Mitchell, Gamera Vs. Guiron, Werewolf, Angels Revenge, and Devil Fish (I’m sure I’m leaving a couple out). I have no doubt many MSTies would disagree with me quite a bit about a bunch of these, but those are my favs. Go watch some of them today. Thanks to valuable reference assistance from Satellite News.